Grout and Tile - G & L Building Services, Inc.
Grout and tile can get dirty very quickly. Grout attracts dirt and tile harbors dirt in its uneven surfaces. While mopping can remove the dirt from the surface, it does not suffice for removing all the dirt from the grout and tile. We first treat your grout and tile with a chemical solution that attacks the dirt and grime that has gotten deep down into your floors. Aggressive floor brushes are used on both the grout lines and the tile in order to unearth the dirt from all the nooks and crannies in your floors. We then hit your floors with 200+ degree water that comes out of a spinning, pressurized jet wand. We slowly and meticulously go over each part of your grout and tile to remove any and all dirt. 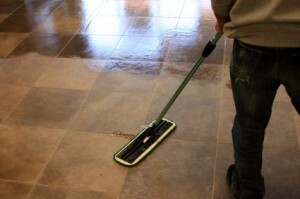 Afterward, we mop the floors to remove any residue from the chemicals or the water jet. This process produces fantastic results. Your grout and tile surfaces will come out clean, fresh and looking like new. Do you need your grout and tile cleaned? Be sure to contact us via our contact page in order to request a quote or more information about our services.